I'm back after a weeklong hiatus! I volunteered to take on the local school's Scholastic Book fair this fall when the original chair had to step down due to health reasons. I had a great time looking at all the books and watching what sold, but sure wasn't expecting it to take up quite as much time to organize and oversee. Sorry I had to put this blog on the back burner for awhile, but that's the way it goes sometimes! 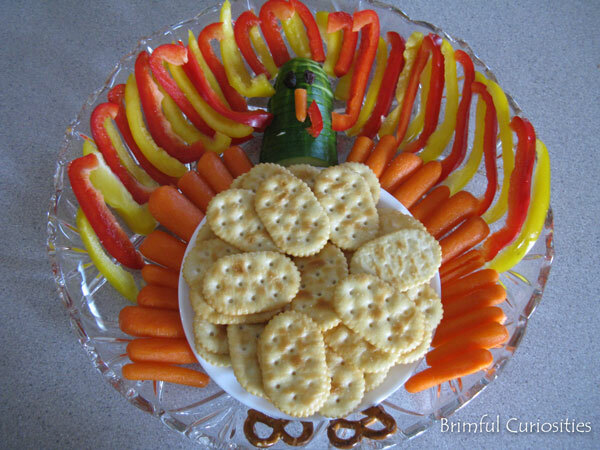 It was my daughter's turn to take a healthy treat to school today and I thought we'd jazz things up a bit with this cracker and vegetable tray arranged to look like a turkey to celebrate the upcoming Thanksgiving holiday. Isn't it cute? I also sent along some ranch dressing for a dip. I know that not all the kids will eat the peppers, but my kids love them! The turkey head is a halved and sliced cucumber, I used raisins for eyes and added pretzel feet. We've been reading some turkey themed books this week including 10 Fat Turkeys by Tony Johnston, illustrated by Rich Deas and A Turkey for Thanksgiving by Eve Bunting, illustrated by Diane de Groat. 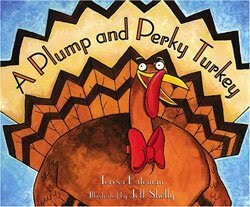 So far the kids' favorite turkey book is one called A Plump and Perky Turkey by Teresa Bateman, illustrated by Jeff Shelly. It's a silly, rhyming story about a town that needs a turkey for their Thanksgiving meal but all the area turkeys take off. The townsfolk devise a plan to create turkey art and advertise for a live turkey model in hopes of tricking a turkey to stay. Pete the Perky Turkey volunteers for the job and shows off his clever side. If we added a bow tie to our veggie turkey, I think he could double as Pete the Perky turkey! What are your favorite turkey books? Thanks for sharing about this book. I think it may own that my younger would like. I am pulling out our Thanksgiving books today; we don't have favorite yet. I like the platter idea; a very neat tie-in with the book. My daughter loves peppers, but my sons won't touch them. It's hard to please everyone, but you know that most kids will at least eat the crackers. It came out very cute. It's wonderful that you were able to help out with the book fair. I bet everyone appreciated all the work you did! That platter is way too cute! Fabulous snack! We have to bring snack to school quite often and I love to see fun and healthy ideas. I love the healthy Turkey Platter! I'm *stealing* this one for an early Thanksgiving dinner we have to attend on Tuesday. As for books a new favorite of mine is Turkey Trouble by Wendy Silvano. It's a very fun read aloud! Happy Thanksgiving to you and yours! That is so ridiculously cute! Did it transport well? We are going to a thanksgiving get together next weekend and I'm supposed to bring a salad like side. I'm tempted, but wonder if it would be in proper form by the time we got there. So I think this is the first healthy Thanksgiving treat I've come across in the past couple weeks. I love it! This would be a good appetizer for Thanksgiving. Thanks for sharing it. Love this, just pinned it so I can do it later this month.